Rare stuff from Ed's attic! The Salvador is back and better than ever! The price, combined with upgraded products and details continue to make this bike one of the highlights of the Subrosa line up. Year after year, the Salvador gets better and provides the foundation for how far you want to take BMX. If having a cool new Subrosa bike wasn't enough, we are throwing in one of our PlanetBMX shirts, to say "Thanks for supporting us!". We really appreciate it! Oh, and we are also going to throw in FREE SHIPPING! What a deal, huh! Free shipping ONLY applies to addresses in the lower 48 States. Bars: 100% Chromoly - 4pc 9.0"
PLEASE NOTE: We can ONLY ship Subrosa complete bikes to USA addresses in the lower 48 States for free shipping. Canada, Alaska and Hawaii residents- PLEASE contact us for a shipping quote, as we will need your complete address in order to calculate correct UPS shipping! If you are outside the USA, you MUST go through an authorized Subrosa bike shop in your country. While our website will allow you to add this bike to your shopping cart, we CANNOT process any Subrosa bike orders leaving the USA. 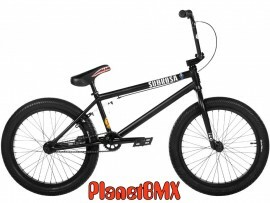 If you are an overseas customer, and you pay for a Subrosa Bike order, your order WILL be cancelled, and your funds will be immediately returned. No exceptions at all. IMPORTANT: To ensure that every component on your bicycle is working properly, PlanetBMX recommends that all Subrosa BMX bicycles be assembled by a qualified bicycle mechanic. Improper assembly of your bicycle may lead to premature wear or failure of individual components. Failure to do so may void the manufacturer warranty.